A federal health insurance program for people who are:65 or olderUnder 65 with certain disabilitiesOf any age and have End Stage Renal Disease or ALS What is it? A joint federal and state program that helps pay health care costs for certain people and families with limited income and resources. 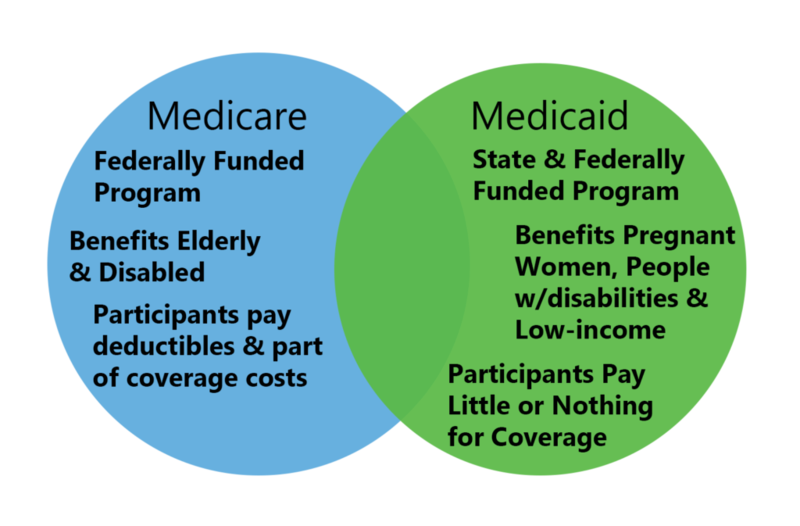 Different programs under the Medicaid umbrella are designed to help specific populations. Federal government Who governs it? Depends on the coverage you choose and may include:Care and services received as an inpatient in a hospital or skilled nursing facility (Part A)Doctor visits, care and services received as an outpatient, and some preventive care (Part B)Prescription drugs (Part D)Note: Medicare Advantage plans (Part C) combine Part A and Part B coverage, and often include drug coverage (Part D) as well - all in one plan. What does it cover? It depends on the coverage you choose. Costs may include premiums, deductibles, copays and coinsurance. What does it cost? It depends on your income and the rules in your state. Costs may include premiums, deductibles, copays and coinsurance. Certain groups are exempt from most out-of-pocket costs. Many people are enrolled in Parts A and B automatically when they turn 65. You can also contact your local Social Security office to see if you are eligible. How do I get it? Eligibility depends on the rules in your state. Call your State Medical Assistance (Medicaid) office to see if you qualify.